William Sydney Baxter was born in Nottingham in 18812, the eldest of three surviving children and the only son of William (b. c1853, Derby) and Mary Anne (née Marwood, c1853, Macclesfield) Baxter. William senior, the son of Reuben, a framework knitter, and Mary Baxter, had trained as a lithographic printer and, by the time he married Mary Ann Marwood in 18763, he had begun to develop a business of his own in that trade in the Sneinton area of Nottingham where both their families lived. William Sydney was the first of their three surviving children and was to join his father in the developing business. In 1901, they were living at 88 St Stephens Road, in the Sneinton area of Nottingham4, with William senior and junior working together in the business. In 1902, William Sydney married Sarah Ashton5, the daughter of John Ashton, a silk dresser who had moved with his family from Macclesfield, Cheshire to the Radford area of Nottingham in the 1880s. In 1902, what was to be the couple's only child, John William, was born6 and during that decade they moved to live at 39 Dovecote Lane, Beeston and set up a printing business on Humber Road, called Beeston Art Printing7. His parents and sisters moved close-by at 9 Rylands Road8 (now the section of Dovecote Lane below Queens Road), in support of the new business. For now, all seemed to be going well but, after war came in 1914, everything was to change. As an older married man, the expectation that he should volunteer early in the war was less intense than for younger men. But in, January 1916, conscription was introduced, initially for single men between the ages on 18 and 41 and this was soon changed to include married men and the upper age limit raised to 50. William was amongst those who were required to attest immediately, which he did at Nottingham on 24 June 19169. He was then placed in the reserve pending recall, which happened on the 7th December 1916 when he was called-up to join the Royal Engineers where his lithographic skills were recognised by a small pay increment but, apparently with few, if any, other privileges. Inevitably, on 19 June 1917, he was posted to the Western Front where he joined 474 Field Company Royal Engineers, then attached to 48th (South Midland) Division which was then positioned and preparing for the Third Battles of Ypres - known as 'Passchendaele'. It was the job of the Royal Engineers to provide military engineering and other technical support to the fighting forces. The range of tasks undertaken was wide but included maintaining roads, railways, water supply, bridges, guns and communication networks. In the terrible conditions that developed at Passchendaele these would become daunting tasks. While they were usually not directly in the front line, they were often exposed to danger from shelling and gunfire and, on 24 August 1917, William was wounded in the nose by shrapnel. He was admitted to 1/2 South Midland Field Ambulance. After treatment, he was discharged on 16th October 1917 and became attached to 98th Field Company, attached to 21st Division which was also engaged in the Passchendaele battles. Although we have no details of the circumstances, it is clear that he was killed in action on 4th November 1917 and buried nearby in a grave marked with a wooden cross inscribed "In memory of 21580 Sapper Baxter W S 98th Fld Coy RE K in A Nove 4 1917". After the Armistice, on 28 March 1919, his and other graves in the area were exhumed and reburied10 in Hooge Crater Cemetery, located four kilometers east of Ypres in West Flanders, Belgium. Hooge Chateau and its stables were the scene of very fierce fighting throughout the First World War. On 31 October 1914, the staff of the 1st and 2nd Divisions were wiped out when the chateau was shelled. From 24 May to 3 June 1915, the chateau was defended against German attacks and in July 1915, the crater was made by a mine sprung by the 3rd Division. On 30 July, the Germans took the chateau, and on 9 August, it and the crater were regained by the 6th Division. The Germans retook Hooge on 6 June 1916 and on 31 July 1917, the 8th Division advanced 1.6 Kms beyond it. It was lost for the last time in April 1918, but regained by the 9th (Scottish) and 29th Divisions on 28 September. Hooge Crater Cemetery was begun by the 7th Division Burial Officer early in October 1917. 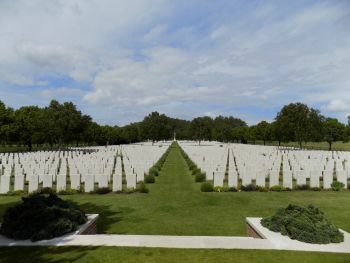 It contained originally 76 graves, in Rows A to D of Plot I, but was greatly increased after the Armistice when graves were brought in from the battlefields of Zillebeke, Zantvoorde and Gheluvelt and a number of nearby smaller cemeteries. There are now 5,916 Commonwealth servicemen of the First World War buried or commemorated in this cemetery. 3,570 of the burials are unidentified11. Percy was posthumously awarded the British Medal and the Victory Medal12. His widow was awarded a pension of 20/5d a week from 20 May 198 for herself and their child13 and she received payment of his Army financial effects of £5 11 2d on 1 February 1918 as well as his War Gratuity of £3 on 2 December 191914. By the end of war, his William's parents had left Beeston to live at 8 Devonshire Road, Carrington, Nottingham where they lived out their lives. Mary Ann died in 1934 and William senior in 1936 and both are buried, along with their daughter Lillian in the Church Cemetery, Nottingham. Their memorial there also remembers their son William as killed in action. Lillian had lived on at Devonshire Road up to her death in 196115. In addition to his entry on the memorial in Beeston Parish Church, William Sydney is remembered on the war memorial in St Stephen's Church, Sneinton, Nottingham. 2His birth was registered in Nottingham Registration District in Q1 1881 (Ref 7b 278). He and his sister Lillian (b. c1884) were baptised at St Stephen's Church, Sneinton, Nottingham on 29 March 1886. His younger sister, Anne Elizabeth, was born in c1889. 3They were married at St Matthias Church, Sneinton, Nottingham on 3 October 1876. 41901 Census, Piece 3170 Folio 163. 5They were married in Nottingham Registration District in Q2/1902 (ref 7b 578). 6His birth was registered in Nottingham Registration District in Q4/1902 (ref 7b 337). The date is recorded as 19 October 1902 in his father's Army Service Record. 7The business and their Dovecote Lane address appears in Wright's Directory of 1911. In the 1911 Census they are living at 39 Dovecote Lane, Beeston (Piece 20432 RD429 SD7 ED7 Sched 320). Curiously, Sarah then records her name as 'Edith', a name she uses in less formal circumstances on later occasions while continuing with 'Sarah' in relatively formal circumstances. 81911 Census, Piece 20429 RD429 SD3 ED4 Sched 4. 10Details of his original memorial and of the exhumation and transfer to Hooge Crater Cemetery are from documentation on the Commonwealth War Graves Commission website. 12William's medal awards are recorded on his Medal Card available on ancestry.com. 13Details of the pension award are included in William's Army Service Record. 14Army Registers of Soldiers' Effects, 1901-1929, available on ancestry.com. 16Is recorded living there with his sister at the time of the Registration in September 1939. Also living there was Gordon Fendick, then the Assistant Director of Education for Notts County Council as well as Deputy Commander of the Nottingham ARP.